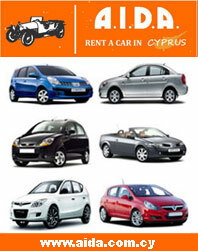 Paforentals is a Paphos car hire company and was established in 1986 as a travel and hire center. Throughout the 80's and 90's our reputation has grown and we have increased the number of our offices to reflect the growth in both visitors and demand for our services. Car hire was introduced early as we recognised the flexibility that the modern traveler desired to explore the island at their leisure, and our fleet of vehicles has been chosen to reflect the needs expressed be that a small compact saloon, a luxury 4x4 or a 7 seater Pajero.